Lawmaker’s property to be seized to repay debt to Skolkovo Foundation | Russian Legal Information Agency (RAPSI). MOSCOW, April 23 (RAPSI) – Bailiffs are trying to locate the property of State Duma lawmaker Ilya Ponomaryov, who has refused to pay 2.728 million rubles (up to $83,000) to the Skolkovo Foundation, Russia’s high-tech development center. “We’re searching for [Ponomaryov’s] property for purposes of foreclosure,” First Deputy Head of the Federal Bailiff Service Sergei Sazanov told RAPSI on Wednesday. He added that they had not succeeded so far. Alexander Stebakov, head of the service’s Moscow Department, said the case against Ponomaryov was not unusual and that his debt was less than many others. Under the law on the protection of personal information, bailiffs cannot publish information on banning Ponomaryov from leaving the country due to un-paid debt. 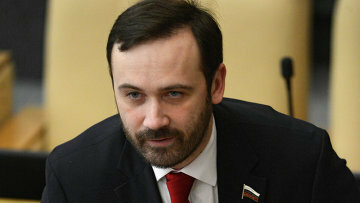 But Stebakov said that Ponomaryov’s debt of 2.7 million rubles is sufficient to impose that ban. The scandal involving Ponomaryov and Skolkovo Foundation was one of the largest last year. Skolkovo filed a lawsuit to force him to repay the 9 million rubles ($300,000) he received for lectures he was contracted to provide. 16:28 23/04/2014 Bailiffs are trying to locate the property of State Duma lawmaker Ilya Ponomaryov, who has refused to pay 2.728 million rubles (up to $83,000) to the Skolkovo Foundation, Russia’s high-tech development center.